Dublin airport is approx. a 35 minute drive and transfers to and from the airport can be arranged from €45.00 one way. The Lodge offers 18 double/ twin ensuite rooms and 4 family rooms. Bridal parties are welcome to book the accommodation at the Lodge exclusively and should you book 18 or more rooms for a minimum of 2 nights then you may use the Lodge for a BBQ or reception buffet on the day after your wedding complimentary. * Terms and conditions will apply. BBQ & Buffet menus available on request. We work with a number of local taxi and coach operators within the area who we regularly use to ferry guests to and from the wedding venues at excellent rates. See end of page for Useful Numbers. We also have a list of local hair dressers and make- up artists within the area or if you wish we can arrange for hair and make up to be done on site at the Lodge upon request. For larger groups of friends/families the Rock House, situated just beside the main Lodge is ideal for groups of up to 32 people. Rates are based on a minimum fee per night. Click HERE for more information on the Rock House and what it has to offer. 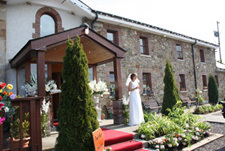 Please see links below for downloadable Info Sheets for Guests & the Bride & Groom with directions to the Lodge from the various local Wedding Venues as well as information for your guests on the facilities and accommodation available here at Newgrange Lodge. 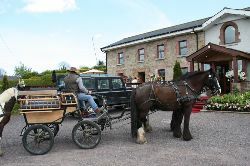 visit us at their leisure to view the premises before staying with us. Please call reception for further information. to ensure we can offer your guests availability around your wedding day.